WEST LAFAYETTE, Ind- The Iowa Hawkeyes (5-2, 3-1) defeated the Purdue Boiler Makers (3-3, 1-2) by a score of 49-35 at Ross-Ade Stadium. The Hawkeyes came out of the gates on fire. Leshun Daniels, Jr. got the scoring started with a short touchdown run on the first possession of the game for the offense. Iowa did not stop there. C.J. Beathard followed that by scoring on a 15-yard rush pushing the lead to 14. Beathard continued the scoring affair by unleashing a 42-yard pass to Riley McCarron for a touchdown extending the lead to 21-0. Kirk Ferentz shows his approval after his team scored a touchdown (Brian Spurlock USA Today Sports). “We came out and played the way we want to this week,” Beathard said. Iowa scored again late in the second quarter with a Leshun Daniels, Jr. four yard run pushing the lead to 28-0. The Boiler Makers left the train station late in the first half. Purdue scored with just over one minute left on the game clock on a 25-yard pass from David Blough to Brycen Hopkins. “It was a pretty good day at the office,” Wadley said. Purdue got one back as they scored on a 53-yard pass from David Blough to Cole Herdman making the score 35-14. Noah Fant joined the scoring club for Iowa as he hauled in his first career touchdown reception making the score 42-14 in favor of the hawkeyes. Purdue tried to mount a comeback but the Boiler Makers would be denied. In the statistics department, Akrum Wadley and Leshun Daniels, Jr. combined for 326 yards and three rushing touchdowns. Iowa finished with a grand total of 520 yards of total offense. 365 on the ground and 155 through the air. Purdue, who only had 11 yards rushing to go along with 133 passing yards in the first half , was stagnant until the middle of the third quarter. 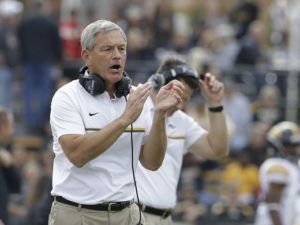 Purdue finished with 504 yards of total offense most of which came when Iowa had their second stringers late in the third quarter and heading into the fourth quarter. Iowa will host Wisconsin on October 22 at 11 a.m. Be sure to listen to our live broadcast on 89.7 FM on your radio dial or stream it live through krui.fm or the TuneIn app.